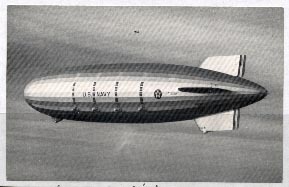 The US Navy experimented with rigid airship operations in the 1930s. The USS Macon Zeppelin or Dirigible flights of the year 1933, sponsored some interesting and multicolored Sea Scout cachets. This flight on September 13, 1933 seems to have been commemorated with three distinctive stops. The first stop was at Ardsley on the Hudson, with 107 cachets produced. The cachet is boxed in a royal blue color and the lettering under the box is green. The second stop on this flight was at West Point Military Academy, with 100 cachets produced. The boxed portion and the lettering under the box is all in black, and the eagle and shield is in orange. The third stop of this flight was on the return past Yonkers, New York with only 50 cachets produced.